CMH Gourmand is written by Jim Ellison. I am a food lover and writer. CMH Gourmand is designed to share my culinary adventures in Columbus (Ohio, the Midwest, and in the old days all over the world). My purpose is to promote eating local. If we can eat local ingredients, great, if not, then how about at least knowing the person on the other side of the counter and in the kitchen. Columbus is an undiscovered culinary capital. Our city has a lot to offer, but to find it, you may have to look around a little bit and eat outside your comfort zone. I’m not talking about comfort as in that extra notch to add to your belt or driving somewhere dangerous – just taking a small risk for a great meal. Many people get locked into eating at a few places over and over again. So consider me a travel agent…for food finds. I am here to take the fear out of your dining. My goal is that you will not find yourself whining that there is nothing (culinary) to do and no where to eat. I have two pet peeves in relation to dining in Columbus. The first, there is no need to be an apologist for Central Ohio dining – we have a great selection considering the size and level of diversity of our city. The second peeve – when someone asks you where you are from – don’t add Ohio, just say Columbus and when your friends come to visit don’t take them to Applebees – this is your city – show it off. I am a lifelong resident of Columbus – in particular, Clintonville. I started writing professionally about food in 1998, crafting culinary tales for Ohio Magazine, C-Bus Magazine, Citysearch.com, Stock & Barrel and other publications. Locally, I judge for various food contests including the North Market and the Ohio State Fair. I was a long time contributor for food related information on Columbus Underground. I teamed up with Columbus Underground and Wild Goose Creative for several fun food festivities such as the Pizza Grand Prix, BaconCamp, BeerCamp and the Dagwood Challenge. I was a wine judge for the Columbus Food and Wine Affair. Nationally, I am a Kansas City Barbeque Society Certified BBQ judge, a Zagat rater, and I contribute to Roodfood.com. I have been referenced in the following books: Everybody Loves Ice Cream by Shannon Jackson Arnold, Midwest Scoops by Michael McGarry, Hamburger America by George Motz and his follow up book: Hamburger America: Completely Revised and Updated Edition: A State-by-State Guide to 150 Great Burger Joints, and The Columbus Food Truck Cookbook. I worked on three food related books to date, all went belly up before publication, but I now know a lot about pizza, regional sandwiches and Columbus Restaurant and Brewery History. I also have a Masters degree in Library and Information Science so in addition to eating to excess, I can research to the extreme as well. I expanded my social media domain as the co-host of Columbus Foodcast, a (now defunct but fun to listen to) podcast focused on local restaurants and food venues from 2009 to 2010. I was 1/3 of the team behind TacoTrucksColumbus.com as well as a contributor/editor for Street Eats Columbus. In July of 2011 Andy, Bethia and I teamed with Mike Beaumont (master of all things video and audio) and Johnny DiLoretto (master of all things Johnny) to create Foodcast on WCBE / 90.5. The show aired every Saturday at 2 pm just before the Splendid Table from July 2011 to July 2014. If you see a guy that looks like an overweight Alton Brown snapping a photo at a hot new eatery or a hole in the wall diner, it is probably me. 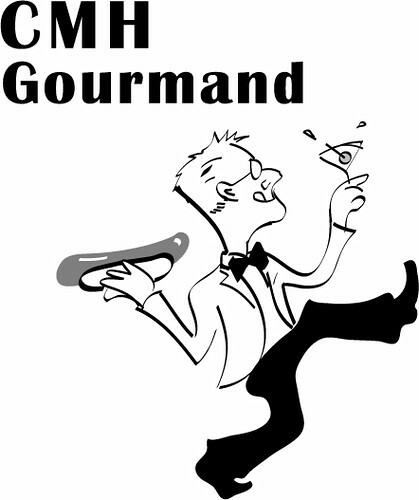 What is a CMH Gourmand? A gourmet is a person with discriminating taste in food and wine, as is a gourmand. Because gourmand can also mean “one who enjoys food in great quantities” or even “a gluttonous eater,” care should be taken to make clear its intended sense. An epicure is much the same as a gourmet, but the word may sometimes carry overtones of excessive refinement. This use of epicure is a misrepresentation of Epicurean philosophy, which, while it professed that pleasure was the highest good, was hardly given to excessive concern with food and drink. (Thanks to Answers.com for that answer). I was once asked online, with a bit of snark, about my credentials. So I took the above and some other items and condensed into the list below. In addition to being obese, there is also some legitimate “science” to balance out my art of eating. I worked for the Food Fort for two years where I consulted for food trucks, carts, food based businesses, restaurants, etc., as well as created events and opportunities for our members. I owned and operated a social media and small business consulting company that worked exclusively with food based businesses 2010 to 2015. I am co-owner and lead guide for Columbus Brew Adventures (brewery and distillery tours) since 2013. I am sure I forgot a couple things. Eat, Drink, Repeat and Enjoy. Well Jim, I finally looked at this at home where I can take my time and enjoy. I picked a fine time to really discover your site, given that I have started a combination Abs/Sonoma/Weight watchers/South Beach diet and IC is out. But, hey, it is still winter and by the time I can buy a scoop from Graeters and eat it in the sun, I will have reached my weight goal (maybe) and eat anything I want(anyway — even if I don’t hit the goal). Wow! “I once ate 10 Italian Beef sandwiches, at 10 places in 8 hours, within the Chicago metro area;” That just jumped off my flat-panel, right into my ramen noodles. Bangin’! I hope you all are doing well. I’ve been enjoying your Columbus blog, as well as your work with ColumbusUnderground.com. Quite thorough and informative! To jump into an introduction, I’m Pat Embry, a long-time Nashville-based entertainment editor and writer. (I wanna hear more about your recent Nashville trip.) For the past two years I’ve served as editorial director at Magellan Press, a locally based imprint specializing in dining and travel guides. Last spring, Magellan successfully published a comprehensive local dining guidebook called Where the Locals Eat-Nashville. We’re now wrapping up many months of work on a companion national guidebook and extensive companion website, Where the Locals Eat http://www.wherethelocalseat.com, which will spotlight the Top 100 restaurants, including winners in any number dining categories (best diner, best contemporary, best Mexican restaurant, etc. ), in each of the top 50 U.S. markets. I’d welcome your feedback, pre-publication, on our Top 100 list in Columbus (or anywhere else). Any obvious clunkers? Any place resting on past laurels? Some place that has recently closed? A spot worthy of consideration that we have neglected? thanks for the link and the comment. I’m new to blogging but having fun doing it! I have been searching around the blog world for blogs on Columbus dining, eating, and restaurant reviews, and found you. I am truly enjoying reading your posts. Although I don’t qualify as a gourmand, I do enjoy a wonderful meal! I have started a website devoted to families in Central Ohio who like to eat out. I review restaurants with kids in tow and find out if they accommodate children with things like kids menus, highchairs, crayons, etc. I do very basic food reviews with the emphasis on the type of food that is offered and things like atmosphere and healthy options for the kids. My site is KidsEatOut.com and I would love to have you check it out and let me know what you think and possibly share it with your readers. Best wishes and I will continue to enjoy your postings! It’s been a while since we talked but I enjoy your posts immensely. You led us to Rice Bowl, a very serviceable Chinese restaurant in the vast Chinese restaurant wasteland known at German Village/Southside. It has grown a bit bleah, though, and thought you would like to know about Eastern Wok. It is located in a down-at-the-heels strip mall on South High, all the way down near Lowe’s. Hard to find but worth it. All is freshly prepared. All is very high quality. All is much better than it has to be. The dumplings are the best I have hard here ( I need to explain that I love dumplings and am almost always disappointed by the bland stuffing in almost all of them. Not at Eastern Wok). Never had a bad, or even mediocre offering. Portions are large but most non-specials can be ordered in a small size,which feed one very well. You may wish to try it. By the way, you can eat in but don’t really want to. Norman! Great to hear from one of my favorite chefs! Thanks for the tip. As for Rice Bowl, now that we are north of 70 again, we do not get there much but I always crave their egg rolls with orange sauce – my favorite of all time. Can’t wait to meet you this week and get your critiques!